I’m glad you’ve decided to either start fencing in Atlantia or move into our fair Kingdom. Or perhaps you just want to know what things like Free Scholar, Sea Dragon, HMA, and C&T mean. If so, you’re in the right place. This article is intended to briefly discuss many of the non-fencing cultural subjects that surround our art in this Kingdom. Atlantia added fencing to its martial activities around 1990 using modern foil blades. It created a Kingdom award for fencing in 1993 which was converted to the Order of the White Scarf in 1996. The Academie d’Espee was formed during that period. See https://www.academiedespee.com/articles/history/ for a lot more detail. The SCA likes titles and awards. We have lots of them! There is an award to recognize skill and/or service in just about every endeavor that people in the society pursue. They are multiple levels of most awards to recognize different levels of accomplishment. This section discusses the fencing awards, but there are also awards for armored fighting, archery, equestrian, arts and sciences, service, and more. The first award most people receive is called an “Award of Arms” or “AoA”. It recognizes that the person has been active and contributing to the SCA for a period of time. When you receive one you are advanced to the Nobility of the SCA and can use the title “Lord” or “Lady” (or a recognized equivalent in another language.) This is not a fencing specific award. The next level of recognition is called the “Order of the Sea Dragon” and is awarded for skill in rapier. It is an “AoA” level award and conveys the same title of “Lord” or “Lady” if the recipient doesn’t already have an AoA. It is indicated by a medallion with the badge of the order. The “Order of the White Scarf” is the next level of rapier recognition. It is indicated by a white scarf worn on the arm. Multiple Kingdoms award white scarves due to a treaty between those participating Kingdoms. In many of those Kingdoms, the titles Don or Doña are used by recipients but not in Atlantia. The highest award for rapier is called the “Order of Defense”. It is indicated by a white leather or cloth collar and/or a mediallion with the badge of the order. Recipients are styled “Master”, “Mistress”, or an equivalent in another language such as “Maestro”. There are very few explicit requirements for awards. Generally a person needs to be performing at a similar level to the most recent several recipients of the award. All SCA awards are selected and presented by our Royalty. Barons and Baronesses of groups may present Baronial awards (many Baronies have a rapier award that I haven’t listed here). Kings and Queens (a.k.a. the Crowns) present Kingdom awards. The two higher rapier awards (and similar awards in other disciplines) are “polling orders”. That means that the Crown must ask the current recipients of the award for advice on who they should recognize with that award. The Crown doesn’t have to follow the advice, but they have to ask. I wrote a much longer opinion piece on the awards process. Anyone can, and should, recommend anyone else for any award. The Crown and the members of the polling orders are not omniscient! Here's a full list of Atlantian awards. And here is the webpage for making an award recommendation. The Academie is an Atlantian guild modeled on the historic London Masters of Defense structure. Participation is completely optional. I enjoy and support it for several reasons: it builds esprit de corps (group identity and morale), it makes identification of Atlantians easier in large battles, it gives fencers recognition from their peers, and it marks more experienced fencers who can be asked for advice and training. Each rank within the Academie takes a period inspired oath (see https://www.academiedespee.com/oaths/ ) and wears a brightly colored scarf on their arm. For the lower two Academie ranks, there is no connection to the Crown award system described above. The higher two ranks indicate a Kingdom award and a choice to participate in the Academie. The rank of Scholar is denoted by a blue scarf. Any authorized fencer is invited to join the Academie as a scholar. Those that choose to do so take the scholars oath surrounded by all of the other members of the Academie, are presented their scarf, and congratulated for their accomplishment of successful authorization. We try to make a big deal about it and make our new fencers welcome. The rank of Free Scholar is denoted by a yellow or gold scarf. To become a Free Scholar, one is sponsored by three Provosts (see below) of the Academie and takes the Free Scholar’s oath. The rank recognizes fencers who have made significant progress in skill and contributions to fencing. It marks people who have been leading and teaching and are worthy of being emulated. It is not a Kingdom award and does not convey any title. A Free Scholar is not viewed as a student of their sponsors, but rather students of all Provosts. A new Free Scholar is recognized with a “prize” where they fight a representative of the other Academie ranks and all comers who hold their new rank of Free Scholar. This is a celebration and not a test. You can't fail your prize. Provosts are people who have received the Order of the White Scarf from the Crown and who choose to take the Provost’s oath to the Academie. Not all white scarves take the oath. My recollection is that three of the current seventy-five recipients of the award are not Provosts. 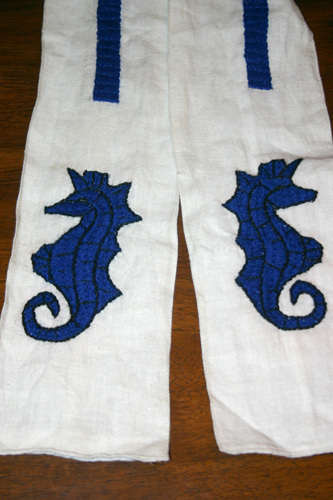 All Atlantian White Scarves (Provost or not) wear a white scarf with a blue center stripe and a blue unicornated sea horse (called “Spike”). Provosts may, in groups of three, make new Free Scholars. Provosts frequently fight a "prize" like new Free Scholars. Masters have received the “Order of Defense” award. You will sometimes see people refer to them as “MoDs”. I use “OD” after my name when I am writing something formal. The London Masters of Defense that the Academie is based on had a rank of Master, but the role of the MoDs in the Academie is not completely defined as of this date and there is currently no Master’s oath to the Academie. The regalia of a Master is a white livery collar as shown below. Participation in the Academie is completely optional. Most, but not all, Atlantian fencers participate. Not participating does not restrict you from receiving awards from the Crown, holding offices, or participating in fencing in any other way. I’ve detailed my personal standards for each of the Academie ranks and Kingdom awards at http://baronllwyd.org/barsandroles. Some fencers choose to become formal students of other fencers. Those students are most often called "cadets" but could also be "men at arms", "ensigns", or sometimes "scholars", "free scholars", or "provosts' (in other Kingdoms that weren't already using those titles). These relationships are also completely optional and personal. I have a separate article with my thoughts on this topic. Please do not rush into becoming someone's student. Take time to get to know the person and discuss expectations. It can be very rewarding but is not the right option for everyone. The SCA is a history focused group and rapier is a martial art, but we still have something separate called "Historic Martial Arts" or "HMA". SCA rapier is sport combat in armor, at full speed, with controlled shots, and may or may not use any period combat techniques. HMA on the other hand is the study of period fighting techniques. It is generally done slowly and out of armor with the intention of understanding what the period book or plate is describing. 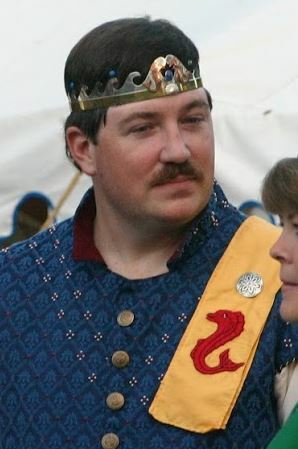 Some people then armor up and try a subset of the period techniques that is legal under an SCA combat ruleset (rapier or armored). This can be extremely effective. I have used a lot of the techniques from my study of Fiore on the Cut and Thrust field. The study and teaching of historic martial arts falls in the Arts & Sciences domain rather than the combat marshallate. People receive Arts and Sciences awards for their understanding and teaching of HMA. Atlantia also has rules for an advanced rapier variant called "Cut and Thrust" or "C&T". The rules are very similar to normal SCA rapier, but a little more armor is required and combatants are allowed to throw controlled percussive cuts that aren't legal in normal rapier. This requires a separate authorization test and that one have been authorized in another SCA combat form for a year. I hope this has given you an overview of SCA rapier in Atlantia. Please feel free to contact me with any questions so I can help address them and then clarify or add that topic to this article. Also, please feel free to ask your question to your local Free Scholar, White Scarf, or Master of Defense. We're wearing the regalia so people know who to come to with questions. Light rapier – modern foil or epee blade. These blades are primarily used for youth combat. While legal, they are rarely used by Atlantian adults. Heavy rapier – A dull, blunt, period sword simulator with an oval or diamond cross section blade and a blade length typically between 30 and 45 inches. Case of rapier – two swords, sometimes called “Florentine”. Rapier armor – protective fencing gear including sturdy cloth or leather torso protection, mask and gloves subject to standards specified in the rules. Other than the mask, legal rapier armor will generally look like normal (most often 16th Century) SCA garb. Prize – a demonstration of prowess as part of a fencer’s advancement to a higher rank. The fencer fights the assembled representatives of their new rank to show their skills. This is a celebration and not a test. You can't fail your prize. Academie d'Espée – Atlantia’s rapier guild based on the London Masters of Defense. Our website is www.academiedespee.com. Free Scholar – Academie rank offered to advanced fencers and leaders. Requires the sponsorship of three Provosts and the good will of the rest of the Provosts. Provost – Academie rank given to those recognized by the Crown to join the Order of the White Scarf who choose to take the Provost's oath. Master/Mistress/Maestro/etc. - Titles used for people recognized as Peers including recipients of the Order of Defense as well as the Order of the Pelican (service) and the Order of the Laurel (A&S). Don/Doña – Title used in other Kingdoms for White Scarves. Cadet – Formal student. Commonly indicated with a red scarf or red collar. Other names include "ensign" and "man at arms".